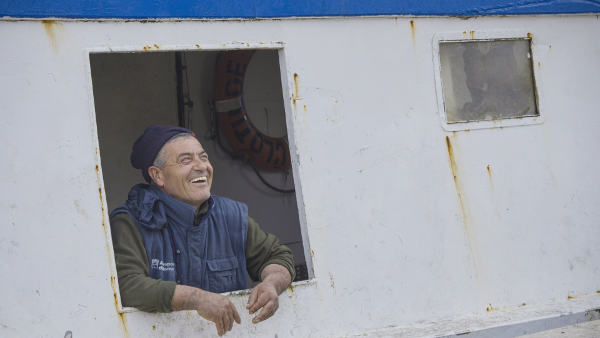 Photo Credit: Bjorn Haldorsen To date skippers, owner/skippers and shore based managers have been interviewed representing a wide range of fisheries and countries (Ireland, Denmark, Spain-the Balearics, France-Eastern Channel, Greece-North Aegean Sea, and Portugal-Azores). They include whitefish and pelagic trawlers (both single and twin rig trawlers), prawn trawlers and seine netters. It also includes small scale fishers using gill and trammel nets and bottom deep-water longlines and handlines. The semi-structured interviews addressed a range of issues relating to the fishermen’s responses to the Landing Obligation regulations. They were asked initially about what they saw as the causes of discarding and the levels of that. They were then asked about methods of mitigating the impacts of the Landing Obligation in their day to day operations. The interviews were carried out following a semi-structured design. The interviewer had a core list of issues that they wished to address. However, the interview was based on asking very broad questions, and allowing the interviewee to talk first about what they wanted to discuss, and following up to obtain the more specific responses sought in the outline (An example used in the Irish interviews is presented after the report). Solutions proposed by fishermen were separated into technical (gear changes) and tactical (fishing behaviour changes). They were also asked about management responses that might or might not help. We have presented the summarised ideas identified by fishermen in a series of different categories in the following tables. We have also sought to identify both commonalities, where fishermen from two or more countries identified the same issues. We have also tried to identify where ideas from one country might be applied to fisheries in others. Conversely, we have also tried to show where the responses reflect the unique characteristics of fisheries management in that country. The most obvious of these would be the quota based management outside the Mediterranean. Is there a need for a discard ban? If not: is there a better way to address unwanted bycatch? What do you think the purpose of the EUs Landing Obligation (LO) is? What are your general views on the EUs LO? What potential is there to reduce discards by gear changes? What potential is there to reduce discards by fishing in different areas than you usually would or by moving away from high discard areas? What potential is there to reduce discards by fishing at different times than you usually would? What kind of changes to gear or tactics have you already tried? What has been the effect of these changes? Is there any documentation of these changes or effects? How has the unwanted catch been handled onboard? How did that work out? How have landings of unwanted catch been handled ashore? How did that work out? What will the impact of the LO be on your fishing activities? What do you think the impact on the crew will be? What do you think the economic impact of the LO will be? Real time closures of areas where high discard concentration are reported? Seasonal closures of areas with high concentrations of juveniles or quota exhausted species? Establishment of fleet information sharing initiatives to avoid areas of high discarding (used with some success in Canadian fisheries)? How would such an initiative work? A ban on certain fishing gears with high discard rates? Multi-month quota management (mainly relevant to Irish case)? Multi-species quotas (e.g. a mixed quota which would cover catches of Haddock, Whiting and Cod)? Preferential allocation of quota to those who can demonstrate low discard rates or who use gears demonstrated to have low discard rates? Limit the maximum quantity of discard (de minimis exemption)? Changes to how international quota swaps are organised and conducted (touching on Relative Stability without mentioning it)? Switch to an effort based management regime (could include RTI’s here)? Establish regional (or local where appropriate) management committees for all fisheries charged with developing adaptive fisheries management plans with a specific emphasis on discard reduction? (Adaptive management in short means that the effectiveness of management strategies must be continuously monitored and adjusted where appropriate – has a lot of crossover with results based management in that the burden of proof emphasis is shifted significantly and within reason the results are more important than the measures employed). Are there any other measures which would help which have not been included in this list? The table below presents the lists of interviews carried out within WP4 and used for this Deliverable. This includes the project task, the DiscardLess partner in charge, the number of interviews and their function/institution. These data are taken from Appendix 1 of the DiscardLess 18 month report. When was/were the interview(s) conducted?